Niederteufen / Budapest, 14 August 2017 – Tresorit, the cloud encryption company, updates its file sync & sharing product for businesses with advanced data control features. Tresorit Business aims to support customers in protecting personal data with end-to-end encryption and achieving compliance with the General Data Protection Regulation (GDPR), the new EU data protection law. Tresorit Business combines built-in end-to-end encryption with data governance and is used by more than 10,000 businesses worldwide to collaborate securely. With Tresorit, customers’ files are encrypted client-side before being uploaded to the cloud. This process guarantees they are only readable by the owners of the data and those who they share with. 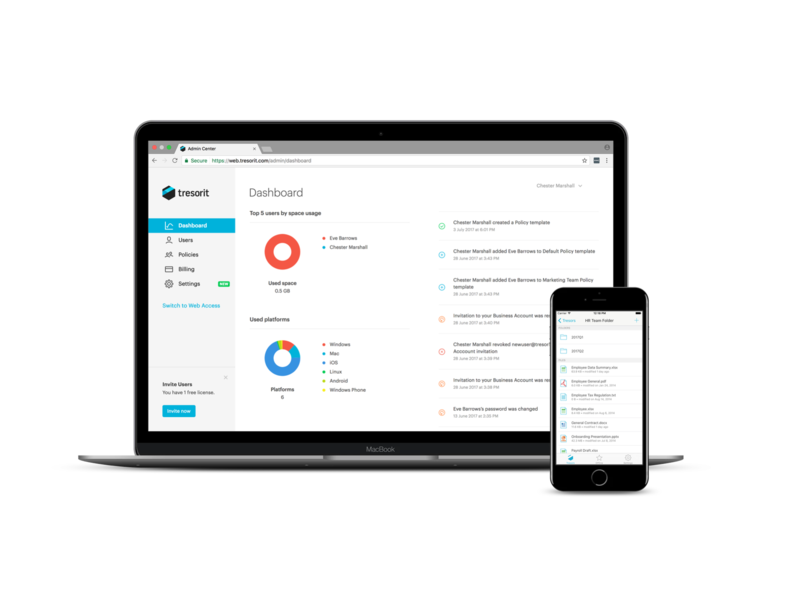 The recent update to Tresorit Business includes new data control tools for admins, as well improvements of the dashboard where business admins can manage their users and oversee security settings and permissions. Setting up security policies to ensure proper handling of personal data is a crucial step to comply with GDPR. “Tresorit is based on the principle that security and ease of use can go hand in hand. We see an increasing number of larger work teams and companies choosing Tresorit Business. Therefore, our development priorities are the data governance features they need for secure, compliant but at the same time convenient work processes”, says Gyorgy Szilagyi Chief Product Officer at Tresorit. The new password recovery and enhanced device control features enable admins to change passwords for users and revoke access from a specific device, in case it is lost or stolen, or when an employee leaves the company. These additions help businesses mitigate employee-related risks such as human errors or activities of malicious employees, which account for more than 40 percent of data breaches according to a recent study. To help the work of business admins, Tresorit redesigned its dashboard called the Admin Center and also improved its performance. Besides, the file sync & sharing tool now integrates with Active Directory, to enable bigger companies and enterprises to manage Tresorit users securely within their domain networks. Coming into effect in less than a year, the GDPR highlights encryption as an “appropriate technical measure to safeguard data”. The GDPR also encourages using access control tools to minimize the access to personal data in a company. Using Microsoft Azure data centers in Europe, Tresorit helps companies comply with the new regulations. As Tresorit’s end-to-end encryption secures data in the cloud in a way that cannot be read by third parties, personal data is not endangered even in case of a server side data breach. This technology can reduce the liability of businesses and can also save them the costs of communicating about a breach. Additionally, Tresorit’s data control tools such as central permission management, Digital Rights Management, and security policy enforcement allow admins to easily oversee security processes and handle access controls within their organizations, a process required by the GDPR. “Using end-to-end encrypted services can simplify compliance processes for companies who manage customer and employee data in the cloud”, says Istvan Lam, co-founder and CEO at Tresorit. “The GDPR is a real opportunity for organizations to enhance the trust of consumers in digital services. Encryption is a tool which helps to secure personal data, but does not solve all GDPR requirements alone. However, it helps businesses worry less about managing data in the cloud and focus on other matters,” he adds. Tresorit is the cloud encryption company providing secure yet user-friendly file sync & sharing for businesses. Tresorit’s end-to-end encryption protects user files from data breaches and government surveillance alike. The team has recently launched ZeroKit; a software development toolkit that helps companies protect user data by integrating end-to-end encrypted data management and secure user authentication. Founded in 2011 by Istvan Lam, Szilveszter Szebeni, and Gyorgy Szilagyi, Tresorit is now used by more than 10,000 businesses globally, including the German Red Cross, IT Services – a T-Systems company, or Erste Bank. This press release was distributed by ResponseSource Press Release Wire on behalf of Tresorit in the following categories: Consumer Technology, Business & Finance, Computing & Telecoms, for more information visit https://pressreleasewire.responsesource.com/about.